A bittersweet love story about the life of Kojima Ari and Fujitani Sousuke as they live together in a de facto relationship (without marriage) in modern-day Japan. Given that it's seven chapters short and it covers a span of five years, the mangaka did a really good job. Actually I could say with all certainty that if it would have been longer it would have felt like it dragged don. It's about what happens after, after the initial butterflies pass and all that's left is you with your significant other. The challenges they face and how to overcome them. You don't feel lost even as time passes. You don't fall in love with the characters but you do feel for them and understand them. The characters are regular people. They could actually be just a random couple you see everywhere. I hope that makes sense. Nothing is exaggerated and it's easy to understand the cause and effect. The cause is what made me mad, just because you watch someone throw their relationship down the drain for no good reason. It's worth a read and since it's seven chapters, why not? 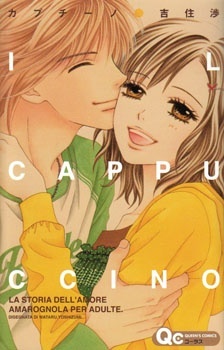 Cappuccino is an enjoyable light josei read. The story is based on a realistic premise and develops with realistic action. Despite that, girls will feel enough empathy for the protagonist to feel suspense and read the next chapter for developments in the relationship. The characters seem realistic as well, but the manga does not explore the emotions deeply enough to compensate for their realistically limited transformations. On one hand, this makes the characters (especially the protagonist's lover) seem slightly flatter than they might be ideally, but at least it's a change from the heavy dramatic tone of a lot of other josei manga. As it is only 7 chapters, the pacing seemed a little quick for a story that spans 5 years. The author does a good job of limiting the choppiness, though, and if it had more chapters, the story would seem drawn out. I'm going to make this as short and meaningful as the manga...I WANT MORE! Everything about this manga is great until it reached Chapter 7. It ended with a (...) instead of a BAM! (SPOILER ALLERt )I want to know if things went well for both of the protagonist after separating, is it really impossible for a second chance? I'm a bit of a romantic so I was really hoping for a finished, concluded, happy ending. I'm left hanging so if anyone knows if there's a continuation on this do buzz me. On the other hand, it reflects a lot of reality in our modern days. Love is love but when trust is trashed then that could really end a should have been great relationship. I'm still feeling sad right now and hopeful at the same time. What do you feel about Ari?